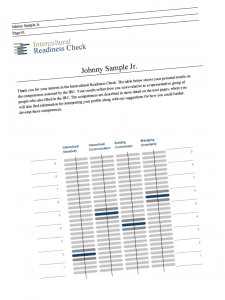 In several training courses and in individual coaching sessions I use the Intercultural Readiness Check©. The IRC is a valid and reliable intercultural self-assessment tool measuring four intercultural competences that make a difference in bridging cultures. You fill in the Intercultural Readiness Check online before the training or coaching session. The IRC is available in seven languages (English, French, Spanish, German, Dutch, Japanese and Mandarin Chinese) and takes only 20 minutes to complete. You will receive your personal IRC profile during the course or by e-mail. This profile consists of 8 pages of feedback which is helpful and relevant and offers straightforward solutions for personal development. You can easily use the IRC feedback to determine your next steps for interacting more effectively with people from other cultures. This is exactly what we do during the (blended) training course or coaching sessions. It’s also possible to only fill in the Intercultural Readiness Check, complemented with one coaching session.